As John Muir wrote in 1913, "There must be places for human beings to satisfy their souls." Truly, Yosemite is one of those places. Words can't express the feeling of grandeur I felt upon entering the park for the first time. I knew I had to try to capture it on canvas. The morning sun bathes the autumn leaves while the Merced River gently rolls across the shallow rocks. 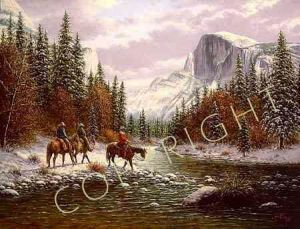 The seasons are changing and the three riders will cross the shallow river for the last time before winter moves in. Exploring the majesty of the wondrous Yosemite Valley beneath Half Dome, their souls are surely satisfied this "Morning on the Merced."